The astrology of asteroid Icarus is a wonderful example of how everything is linked. The naming of the asteroid itself, the mythology, the psychological and astrological interpretations, they all tie together beautifully in the discovery chart. I will attempt to piece the story together chronologically, starting with the ancient mythology and ending up with the discovery chart, which I believe has never been written about before now. Although Icarus is a character from Greek mythology, probably the best version of the story comes from the Roman poet Ovid. Icarus was the son of the master craftsman Daedalus of Athens. 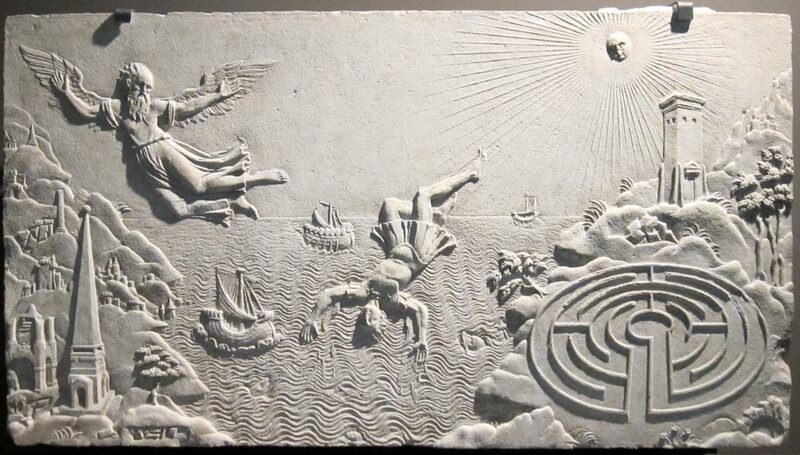 King Minos of Crete commissioned Daedalus to built a Labyrinth near his palace at Knossos to imprison the Minotaur. Unfortunately, a mixture of adrenalin and curiosity drove Icarus toward the Sun, melting the bees wax. The wings fells off, he fell into the Icarian Sea and drowned. Early 20th century writers studied the mythology of Icarus from a psychological and psychiatric perspective. They coined the term Icarus complex, which involves the “structure and consequence of personal over-ambition“, likening it to the extreme ups and downs of bi-polar disorder. Asteroid Icarus was discovered in 1949, by Walter Baade. It is conventional for asteroids to be named after mythological characters, but this naming was not random. Asteroid 1566 Icarus is a near-Earth asteroid, coming closer to the Sun than Mercury. Up until the year 2000, it held the record for the asteroid which came closest to the Sun. In 1967, it was feared that asteroid Icarus may hit the earth. This led to Project Icarus at a cost of $1.6 billion. The project inspired the 1979 film Meteor, starring Sean Connery and Natalie Wood, which lost $8 million. Asteroid Icarus was discovered on June 26, 1949, by Walter Baade at the the Palomar Observatory [Objects: Finding Them Before They Find Us, Donald K. Yeomans, p.148.]. Wikipedia and the NASA website list the discovery date as June 27, based on Universal Time. So with California time being 8 hours behind UT, Icarus must have been discovered between 4pm and midnight at the observatory. I have opted for 11pm but won’t look at time-sensitive points like the Ascendant. Straight away we find a link between the mythology, the psychology, project Icarus and the astrology. Mercury conjunct Mars is rash decisions, impulsive actions, risk-taking, intolerance, danger in travel. This abrasive conjunction is directly opposite (bi-polar) asteroid Icarus. We can see the vivid inspiration Kim mentioned, with asteroid Icarus sextile Neptune. This also reveals the first link to the flight theme too. Neptune is in constellation Corvus, the Crow. The fixed star Algorab is associated with the wrong handling of matters, accidents and injuries. Saturn sextile Uranus is the “learning self-control once free of the restriction” that Zane talked about. This lesson becomes critical and the major theme in this chart because both planets are quincunx Jupiter. The resulting Yod aspect pattern is focused on exuberant and excessive Jupiter. This is the “Travel between the extremes” that Daedalus advised. It is the Icarus complex of “personal over-ambition” in the psychology. It is the over-estimating and over-budget Project Icarus. And it is everything that astrologers have been saying about asteroid Icarus. 3. In “additional asteroids or hypothetical planets”, add 1566. Thanks Jamie for a great asteroid study.I have found asteroids to be an integral aspect and has had incredibly synchronistic significant additions to my chart study & self exploration.As i read i knew this asteroid would have a significant placement,and effect on my cardinal cross,though not directly aspecting the cross.As transiting Icarus conjuncts transiting Venus,they are approaching the natal conjunction of Icarus & Mercury Cap 23*4th(2 mins). Ha, hah! I just sent your chart to you before I looked at the comments, because I also knew Icarus must be smack dab in the meat of your chart. This astrology is kismet ! Thanks Michael. I actually decided to write this post when I was researching Venus retrograde for next month. Venus stations retrograde conjunct asteroid Icarus. Amazing synchronicity going on here for me, Jamie. 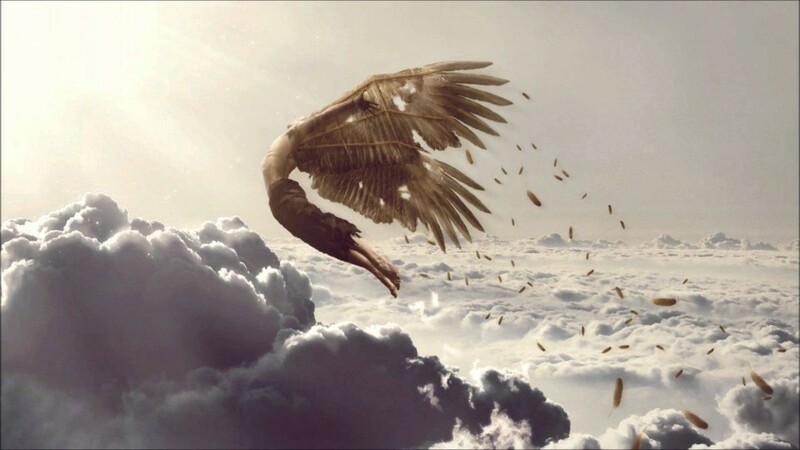 Icarus is only 3 minutes of arc from my natal 12th house Venus in Scorpio! I’ll be very interested in their upcoming conjunction at Venus’ stationary point. Like Mikael, I have also been learning about asteroids and their impact on my natal chart, in synastry with my GF, and their transits. Thanks for bringing Icarus to my attention; there isn’t a lot written about it. Amazing timing, Jamie. Icarus makes only one close aspect in my natal: sextile Libran NNode, inconjunct Aries SNode. I note that the discovery chart nodes are Aries NNode, Libra SNode. As soon as I saw this I knew it would be a significant asteroid to both Michael’s and my own chart. Like Greg, Michael and I have been studying asteroids together, in much mirth at the synchronicities when we discover them. Michael’s NNode is also Aries. I’ve been dredging through a prolonged period of “fleeing the nest”, which at this point will be more like falling through it into deep waters when it finally disintegrates around me. Significantly, Chiron as been transiting to and fro in Pisces, and is right now exactly opposite the natal Icarus at 9 Virgo. The Saturn and NNode transits in Scorpio have been sextiling n-Icarus, while trining transiting Chiron. The key theme for me has been patience, and concentration on keeping my balance and focus, despite the sensation that the floor of my nest is constantly tilting, like a boat in a stormy sea. Ooops! I seemed to have clicked an UN-FOLLOW BOX and cant reverse it.So i’m posting to see if this reverses,if not,can you fix that Jamie? I’ve changed the commenting system now anyway Michael. You can subscribe to comments below. Jamie ~ I’ve got a little thread on Atlantis going at the AD forum. I was impressed with Icarus’ placement in the Atlantis chart, which mirrors the themes of ascension and fall; and by it’s transit to a cardinal grand grand cross in the Atlantis natal now. Here’s a link to the current discussion on Icarus over there. Thanks Moira, keeping busy on the Google Plus Astrology Community? How might this be interpreted ? Is it just me or is anyone else having difficulty following the continuity of the comments? Icarus is conjunct my natal north node – not sure whether I should take this as a warning – do I need to go where Icarus went or should I learn from this? I have always been fairly risk-averse, and this myth made a pretty strong impression on me as a child. And of course the “middle way” is also the path recommended by the I Ching.